Too bad about the truck that turned her into paste, then. Luckily, or unluckily, fate deigned to give the poor girl another chance to make something of herself in a bizarre universe brimming with magic, spaceships, and... giant talking spiders? This "second chance" seems less than ideal. Mystic Nan has not been reviewed yet. 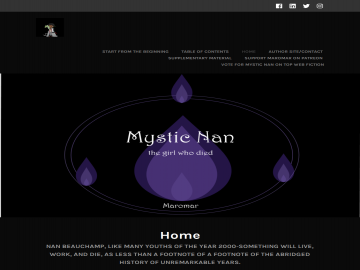 Mystic Nan has not been recommended yet.